Drug-induced kidney disease occurs primarily in patients with underlying risk factors. A number of factors enhance the vulnerability of the kidney to the nephrotoxic effects of drugs and toxins. They are broadly categorized as patient-specific, kidney-related, and drug-related factors. One, two, or all three of the factor categories can act to promote various forms of renal injury. Importantly, all compartments of the kidney can be affected and result in one or more classic clinical renal syndromes. These include acute kidney injury, various tubulopathies, proteinuric renal disease, and chronic kidney disease. Recognizing risk factors that increase renal vulnerability to drug-induced kidney disease is the first step in reducing the renal complications of drugs and toxins. The kidney performs a number of essential functions in the body. Most important are the clearance of endogenous waste products, control of volume status, maintenance of electrolyte and acid-base balance, and endocrine function. Metabolism and excretion of exogenously administered therapeutic and diagnostic agents as well as environmental exposures are other major functions. In its role as the primary eliminator of exogenous drugs and toxins, the kidney is vulnerable to develop various forms of injury. This paper will review the important nephrotoxins that the kidney is exposed to, the factors that increase vulnerability of the kidney to potential toxins, the renal compartments afflicted by toxins, and the clinical renal syndromes promoted by these agents. The first step in the development of nephrotoxicity requires adequate exposure to the offending agent. Humans are exposed to a variety of potential nephrotoxic substances on a rather frequent basis (Table 1). Several therapeutic agents have known nephrotoxic potential; classic examples include anti-microbial agents, chemotherapeutic agents, analgesics, and immunosuppressive agents (1–8). While most are prescribed, many others are available to the general population over-the-counter. Numerous new drugs with unknown toxic potential are constantly being released for use into clinical practice. Diagnostic agents, in particular iodinated radiocontrast and high dose intra-arterial gadolinium, are another source of nephrotoxin exposure (9,10). An important and unregulated source of potentially nephrotoxic substances is the alternative/complementary products, which include herbal remedies, natural products, and nutritional supplements that are widely available at most health food stores (11,12). More concerning is the harmful contaminants and chemicals contained in the products that are not listed on the label (11,12). Interaction of herbal products with conventional drugs is also a potential source of toxicity. Examples of nephrotoxic alternative products include aristolochic acid, Ephedra species and Glycyrrhiza species (11,12). Adulteration of herbal products with dichromate, cadmium, and phenylbutazone also causes significant renal injury (11,12). A recent example of adulteration is worth mentioning. To falsely elevate protein content, melamine was added to baby formula. This is an example of contamination with a substance that causes acute kidney injury (AKI) and nephrolithiasis in neonates (13). Finally, environmental exposure to various nephrotoxins remains a problem (14–16). Included are toxins such as lead, cadmium, mercury, copper, uranium, and bismuth, to name a few. An increasing nephrotoxic concern is lead exposure, even at levels that are considered safe and acceptable to governmental agencies. Low-level lead exposure appears to exacerbate underlying chronic kidney disease (CKD), leading to more rapid progression to advanced stages of CKD and dialysis-requiring end-stage renal disease (ESRD) (14–16). A simplified approach to understanding the renal vulnerability to nephrotoxins entails the classification of risk factors into three major categories (Table 2). Each category or specific risk factor contributes to the enhanced development of kidney injury. In general, more than one of the risk factors is acting to promote renal injury. Most often, at least two or all three conspire to cause various forms of clinical kidney disease. It is these factors that explain the variability and heterogeneity seen with drug or toxin-induced kidney disease. Underlying patient-specific characteristics comprise the first risk factor category (Table 2). The patient exposed to drugs and other substances is predisposed to develop nephrotoxicity when certain underlying risk factors are present. Many of these factors are nonmodifiable, such as older age and female gender. Risk in the elderly and females occurs through the following: 1) changes in total body water, which is reduced in setting of decreased lean body mass and leads to drug overdose; 2) unrecognized lower GFR despite normal serum creatinine concentration; and 3) reduced drug binding to proteins due to hypoalbuminemia, which results in increased free drug concentrations (17–20). The elderly also have increased propensity to vasoconstriction from excessive angiotensin II and endothelin and have higher levels of oxidatively modified biomarkers (17). These factors combine to expose the patient to excess drug concentration and risk of nephrotoxicity. Along these same lines, both underlying AKI and CKD are important risk factors for increasing vulnerability to nephrotoxic injury (18–20). 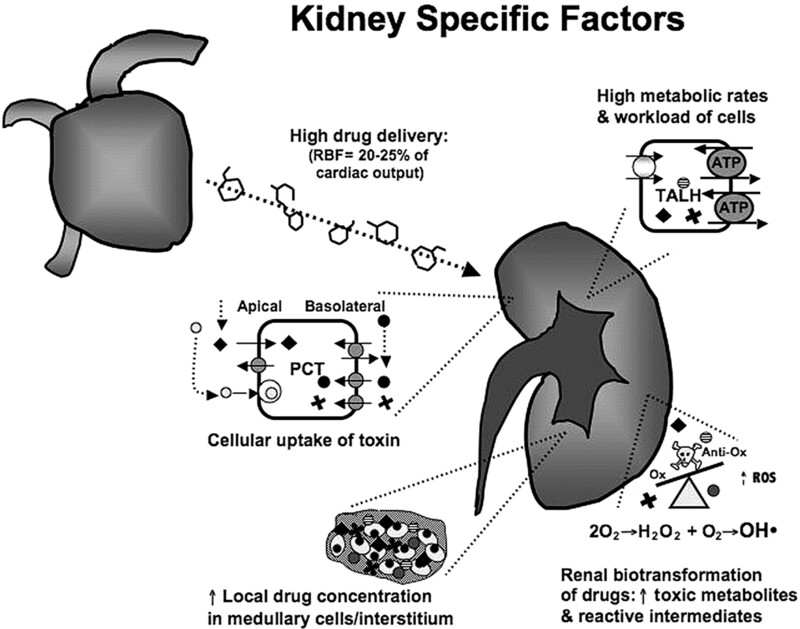 Excessive drug dosing, exposure of a reduced number of functioning nephrons to toxins, ischemia preconditioned tubular cells, and more robust renal oxidative injury response to toxins are all contributors in these settings. Nephrotic syndrome and cirrhosis raise risk through multiple mechanisms that include altered renal perfusion from reduced effective circulating blood volume, hypoalbuminemia with increased free circulating drug, and unrecognized renal impairment (18–21). The last point is a particular problem as serum creatinine is often low or normal in these patients. Obstructive jaundice also enhances toxicity to certain drugs, such as the aminoglycosides through altered hemodynamics (decreased renal blood flow) and direct effects of bile salts on tubular epithelia (22). Both true (vomiting, diarrhea, diuretics) and effective volume depletion (congestive heart failure, ascites, sepsis) increase renal vulnerability to various agents. Through induction of renal hypoperfusion and prerenal azotemia, these underlying processes enhance nephrotoxicity of many drugs and substances. In particular, renal hypoperfusion increases nephrotoxicity in drugs excreted primarily by the kidney (excessive drug dosing), in those reabsorbed in the proximal tubule (increased intracellular concentration), and in those that tend to be insoluble in the urine where crystal precipitation occurs within distal tubular lumens with sluggish flow (18–21,23). Metabolic disturbances also increase renal vulnerability to certain drugs and potential toxins. Hypokalemia, hypomagnesemia, and hypocalcemia are electrolyte and divalent ion disorders that increase renal toxicity associated with aminoglycosides (18–20). Severe hypercalcemia induces afferent arteriolar vasoconstriction and renal sodium/water wasting, leading to prerenal physiology, which enhances nephrotoxic drug injury. Patients with metabolic disorders that alter urine pH are at risk to develop intratubular crystal deposition when certain drugs and substances precipitate within tubular lumens in the distal nephron (23,24). Systemic metabolic acidosis or alkalosis may decrease or increase urine pH, while proximal and distal renal tubular acidoses are associated with alkaline urine due to impaired renal ability to excrete H+ ion. Acidic urinary pH (< 5.5) increases crystal deposition with drugs such as sulfadiazine, methotrexate, and triamterene that are insoluble in a low pH environment (23,24). Alkaline urine (pH >6.0) increases crystal precipitation within tubular lumens from drugs such as indinavir, oral sodium phosphate solution, and ciprofloxacin (23–25). In addition, drugs such as topiramate, zonisamide, and acetazolamide alkalinize the urine through inhibition of carbonic anhydrase and promote precipitation of calcium phosphate within tubules, thereby enhancing renal stone formation (26,27). The underlying genetic makeup of the host can also enhance renal vulnerability to potential nephrotoxins (28–30). The drug or its metabolite form adducts that modify their physical structure, making them more immunogenic. There is, however, significant heterogeneity in the response of patients to drugs and exogenous exposures. One obvious example is the heightened allergic response of some individuals as compared with others. Differences in innate host immune response genes can predispose certain patients to develop an allergic response to a substance. The variability of immune responses has been demonstrated in patients who develop drug-induced interstitial nephritis, which appears to be a T cell driven process (31). This translates into enhanced vulnerability to an allergic response in the kidney and development of an acute interstitial nephritis. An area of intense interest is the role of pharmacogenetics as an explanation for the heterogeneous response of patients to drugs as it relates to efficacy and toxicity (28–30). The hepatic cytochrome P450 (CYP450) enzyme system has been well studied, and several CYP450 enzyme gene polymorphisms are associated with reduced metabolism and subsequent end organ toxicity. The kidney also possesses CYP450 enzymes that participate in drug metabolism (28–30). One would expect that gene polymorphisms favoring reduced metabolism could increase nephrotoxic risk as well. Polymorphisms of genes encoding proteins involved in the metabolism and subsequent renal elimination of drugs have been described and are correlated with various levels of drug sensitivity. Specific to the discussion of nephrotoxicity, loss-of-function mutations in apical secretory transporters (reduce cell drug efflux into the urine), and mutations in kinases that regulate drug carrier proteins can impair drug elimination and promote toxicity by elevating intracellular toxin concentrations (29). In the future, more information regarding how patients differ in the function and regulation of channels, transporters, and carriers that regulate elimination of drugs and other compounds cleared by the kidney will be brought to light. An elegant example of this is seen with tenofovir-induced Fanconi syndrome (32). In patients exposed to tenofovir who developed Fanconi syndrome, a single nucleotide polymorphism (1249 G→A SNP) was present in the gene coding the multidrug-resistant protein-2 (MRP2) efflux transporter, which transports tenofovir out of the cell. Tenofovir-exposed patients who did not develop Fanconi syndrome did not have the polymorphism. The next category of risk relates to the mechanism by which the kidney metabolizes and excretes various drugs and toxins (Figure 1). Significant renal exposure to potential nephrotoxins occurs due to the high rate of drug and toxin delivery to the kidney, a result of the high blood flow to the kidney, which approaches 25% of cardiac output. Many renal cells, particularly those in the loop of Henle, exist in a relatively hypoxic environment due to the high metabolic rates required to actively transport many solutes via Na+-K+-ATPase driven transport. This excess cellular workload and hypoxic environment promotes increased sensitivity to injury when exposure to potentially nephrotoxic substances occurs (33,34). Another factor that enhances renal nephrotoxicity is the high concentration of parent compounds and their metabolites that develop in the renal medulla and interstitium from the enormous concentrating ability of the kidney (33,34). Elevated tissue concentration of these toxins promotes injury through both direct toxicity and ischemic damage (reduced prostaglandins, increased thromboxane). Kidney specific factors that enhance nephrotoxic risk are noted. First, high RBF increases drug delivery to the kidney. High metabolic rates of cells increase risk for nephrotoxicity with certain drugs. Renal biotransformation of drugs to toxic metabolites and ROS overwhelms local anti-oxidants. Increased concentration of drugs in the medulla and interstitium causes nephrotoxicity. Finally, apical uptake of certain drugs (aminoglycosides, sucrose) and basolateral transport of drugs through the OAT (tenofovir) and OCT (cisplatin) transporters increases renal toxicity. Abbreviations: RBF, renal blood flow; OAT, organic anion transporter; OCT, organic cation transporter; ROS, reactive oxygen species. Biotransformation of drugs, xenobiotics, and other substances by multiple renal enzyme systems, including CYP450 and flavin-containing monooxygenases, favors the formation of toxic metabolites and reactive oxygen species (33–35). The presence of these byproducts of metabolism tilts the balance in favor of oxidative stress, which outstrips natural antioxidants and increases renal injury via nucleic acid alkylation or oxidation, protein damage, lipid peroxidation, and DNA strand breaks (33–35). Enhanced toxicity in proximal tubular cells occurs due to the extensive cellular uptake of potential toxins and drugs by both apical and basolateral transport systems. Apical uptake of substances occurs via endocytosis and other transport pathways (36–40). Examples include the polycationic aminoglycosides (Figure 2), heavy metals, and various complex sugars and starches. Following endocytosis of aminoglycosides, which involves the endocytic receptor (megalin) for cationic ligands, these drugs are translocated into the lysosomal compartment where they accumulate and subsequently form myeloid bodies (33,34,36). These bodies are membrane fragments and damaged organelles formed as a consequence of aminoglycoside inhibition of lysosomal enzymes. This apical pathway of uptake leads to accumulation of a critical concentration of aminoglycoside within cells, which triggers an injury cascade leading to cell injury and death. Another pathway of proximal tubular cell toxin exposure occurs via basolateral delivery of endogenous and exogenous organic ions (anions and cations) by peritubular capillaries (39,40). Toxicant delivery via peritubular capillaries is followed by uptake into proximal tubular cells via a family of transporters, including human organic anion (HOAT) and cation (HOCT) transporters (39,40). As classic examples, acyclic nucleotide phosphonates are transported via HOAT (39), whereas cisplatin is transported via HOCT. 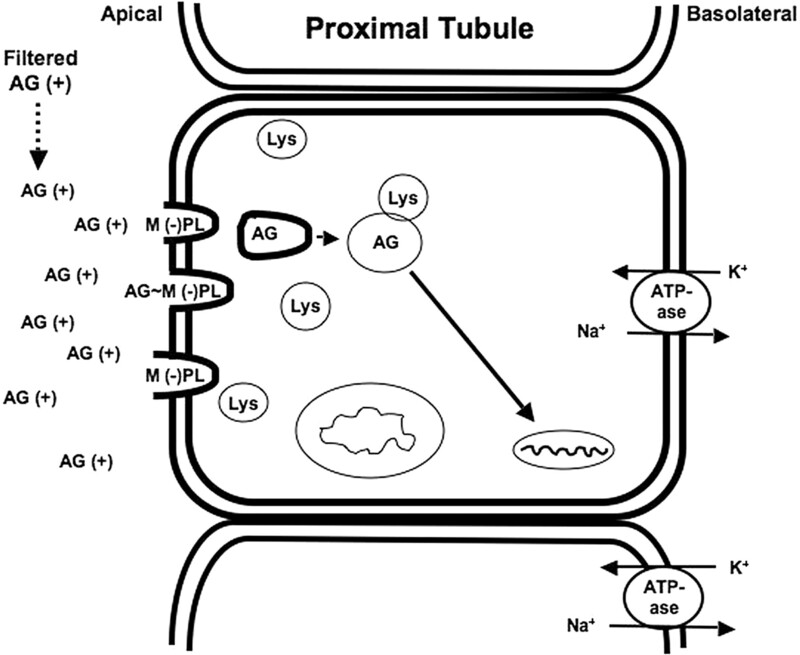 Transport of toxicants into cells, followed by movement through the intracellular space via various regulated carrier proteins, and subsequent exit from the cells via apical transport proteins enhances toxicity in proximal tubular cells (40). Loss of function mutations in and competition for apical secretory transporters (41), which reduces toxin efflux from cell into urine, may promote accumulation of toxic substances within proximal tubular cell and cause cellular injury via apoptosis or necrosis (Figure 3). This extensive trafficking of substances increases renal tubular exposure and risk for elevated concentration of toxin when other risk factors supervene. Apical membrane handling of substances, in this example aminoglycosides, by proximal tubular cells. Aminoglycosides interact with anionic phospholipids/megalin on the apical surface where they are endocytosed and enter the cell. The drug is then translocated into lysosomes, where it is associated with various forms of cellular injury. Abbreviations: AG (+), aminoglycoside; (-) PL, anionic phospholipids; M, megalin; Lys, lysosome; Na+, sodium; K+, potassium. Basolateral handling of substances, in this example tenofovir, by proximal tubular cells. Tenofovir (TDF) is delivered to the basolateral membrane, transported into the cell via the organic anion transporter-1 (OAT-1), and excreted by various apical transporters into the urinary space. In this example, transport by the multidrug-resistance protein (MRP2) transporter is inhibited or dysfunctional, causing intracellular accumulation of drug and nephrotoxicity. Abbreviations: Pgp, P-glycoprotein; PEPT1/2, peptide transporters; OA, organic anions; OC, organic cations; OAT, organic anion transporter, OCT, organic cation transporter; Na+, sodium; K+, potassium. The underlying characteristics of the offending agent also play an important role in the development of nephrotoxicity. From a practical standpoint, prolonged therapy at high doses with toxic substances enhances renal injury based on excessive renal exposure in the absence of other risks. Exogenous substances and their metabolites that are insoluble in human urine may cause renal injury. In addition to unique characteristics of the offending agent that induce insolubility, factors such as urine pH, sluggish tubular urine flow rates, and rapid parenteral or excessive dosing (high peak serum and urine concentrations) enhance risk for precipitation and crystal formation in distal nephron tubular lumens (19–21). Commonly used medications such as acyclovir, methotrexate, sulfadiazine, indinavir, atazanavir, and oral sodium phosphate solution are examples. Aminoglycosides with more positive charge are more likely to cause nephrotoxicity, perhaps due to enhanced interactions with negatively charged membrane phospholipids and megalin (7,36). This is reflected by the greater nephrotoxicity of the neomycin as compared with amikacin. Drug combinations also raise risk of nephrotoxicity. Combinations such as aminoglycosides and cephalothin, nonsteroidal anti-inflammatory drugs (NSAIDs) and radiocontrast, and cisplatin and aminoglycosides are a few examples of enhanced nephrotoxic risk with concurrent drug administration (18–21). As mentioned previously, various drugs and endogenously produced molecules can compete for transport proteins in the proximal tubular cells, thereby reducing renal elimination and increasing intracellular drug/toxin concentration (1,3,5,23). This favors development of nephrotoxicity. Several drugs and toxins are more highly nephrotoxic and can promote renal injury, even with brief or low-level exposure. Examples include the aminoglycosides (in particular neomycin), amphotericin B, the polymyxins, zolendronate, and the antiviral agents adefovir and cidofovir (1,3,5–7,42–44). Aminoglycosides are a classic nephrotoxin. Accumulation of high concentrations within lysosomes and release into the cell cytoplasm promotes phospholipid membrane interruption, oxidative stress, and mitochondrial injury that cause proximal tubular cell apoptosis and necrosis, leading to clinical AKI. Amphotericin B, and the lipid/liposomal formulations to a lesser degree, disrupt cellular membranes and increase permeability to cations, resulting in tubular dysfunction due to cell swelling and lysis (42). Colistin and polymyxin B are polymixin antimicrobials that are extremely nephrotoxic with a very narrow therapeutic window. Their toxicity appears to be due to the D-amino content and fatty acid component, which increase membrane permeability and influx of cations (43). As seen with amphotericin B, cell swelling and lysis results. The acyclic nucleotide phosphonates enter the cell via basolateral HOAT-1 and promote cellular injury through multiple mechanisms. Mitochondrial injury, as manifested by mitochondrial enlargement, clumped cristae, and convoluted contours, occurs with adefovir through inhibition of DNA polymerase gamma, which is the sole DNA polymerase in mitochondria (3,5). Cidofovir, which forms cidofovir-phosphocholine (analog of cytidine 5-diphosphocholine) within cells, interferes with synthesis and/or degradation of membrane phospholipids, resulting in proximal tubular injury (3,5). Tenofovir also impairs cellular energetics through mitochondrial disruption and other intracellular processes (3,5,23). A unique and newly recognized form of nephrotoxicity has been described with anti-angiogenesis therapy (45,46). Vascular endothelial growth factor (VEGF), produced by adjacent podocytes, is required to maintain normal fenestrated endothelial function and is particularly important for normal functioning of the glomerular basement membrane (47). Reduction in VEGF or its effects by the various anti-angiogenic drugs leads to loss of the healthy fenestrated endothelial phenotype and promotes microvascular injury and thrombotic microangiopathy, causing proteinuria and kidney disease. Also, reduced nephrin expression in the slit diaphragms from these drugs may also contribute to proteinuria. While these drugs cause a number of renal lesions, endothelial injury and thrombotic microangiopathy are the most commonly noted (46,48). Nephrotoxic substances produce disease in all compartments of the kidney. The entire nephron and collecting duct system are capable of being injured by various nephrotoxins. For ease of classification, they can be divided into the following renal compartments and the associated disease components: 1) Hemodynamic (prerenal disease); 2) Renal parenchyma (intrinsic renal disease); and 3) Collecting system (postrenal disease). Hemodynamic disturbances induced by certain medications may produce a prerenal form of kidney injury in patients at risk. Increased afferent arteriolar tone from direct or indirect vasoconstrictors and reduced efferent arteriolar tone from ACE inhibitors and ARBs in patients with true or effective volume depletion or underlying kidney disease alter renal hemodynamics (1,5,6). They do so by reducing intrarenal perfusion and lowering intracapillary hydraulic pressure, thereby reducing the filtration fraction and ultimately the GFR. Intrinsic kidney disease due to exogenous nephrotoxins may occur in several compartments. Medium and small vessel vascular disease may result from toxin or drug-induced thrombotic microangiopathy (TMA) from endothelial injury or antibody formation against VWF cleaving protease or induction of a hypercoaguable state. Glomerular disease with decreased GFR and proteinuria develops from a wide array of toxins and drugs (1,5,23). Injury occurs via damage to glomerular endothelial cells, visceral epithelial cells, microthrombi within glomerular capillaries, or immune complex deposition within glomerular capillary basement membranes from a drug antigen inducing antibody formation (1,5,23). Tubular disease, particularly in the proximal tubule, is a common complication of prescribed nephrotoxins and environmental exposures. 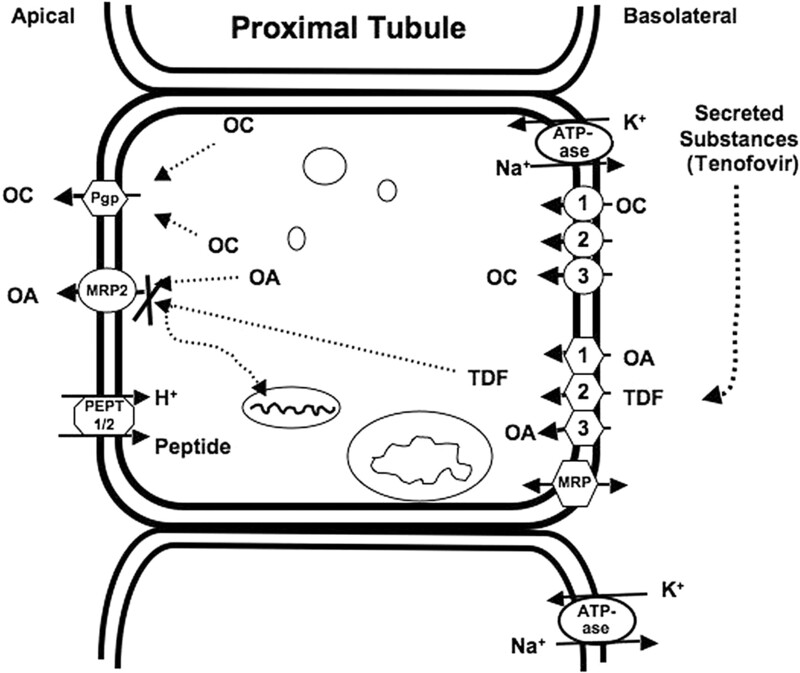 As was previously reviewed, the mechanism by which the proximal tubule handles substances contributes to enhanced nephrotoxicity in this nephron segment. Proximal cell tubular toxicity develops due to direct nephrotoxic effects (mitochondrial dysfunction, lysosomal hydrolase inhibition, phospholipid damage, increased intracellular calcium concentration), formation of reactive oxygen species with injurious oxidative stress, and osmolar effects with loss of normal cell-cell contact and tubular luminal occlusion (23,33). In the loop of Henle, ischemic injury from reduced medullary oxygen delivery (shunting blood to the cortex) and enhanced tubular cell metabolic rate can occur with radiocontrast, especially in combination with NSAIDs (1,5,23,33). Rhabdomyolysis with myoglobinuria can develop following therapy with certain drugs or toxins. It causes renal injury via hemodynamic effects, tubular toxicity from direct toxicity of ferrihemate, and tubular obstruction from myoglobin casts (1,23,33). In the cortical and medullary collecting ducts, tubular injury develops from precipitation of insoluble crystals within tubular lumens with or without an interstitial reaction (1,3,5,23,25). Exogenous drugs or toxins promote this type of kidney disease. Finally, disease within the interstitial compartment develops from either an acute process such as acute interstitial nephritis (AIN) or chronic insult such as chronic tubulointerstitial nephritis (CTIN). AIN represents an exuberant host immune response to an exogenously administered medication or toxin (1,5,23). CTIN develops from persistent, untreated inflammation associated with AIN or chronic ischemia/toxicity from certain analgesic combinations, mesalamine, heavy metals, or nephrotoxic alternative/herbal medications (1,2,23,49). Disease of the collecting system (postrenal disease) represents the last compartment of kidney injury that occurs from certain medications or toxins. Both AKI and CKD result from obstructive renal disease (1,23). Many drugs and toxins cause either intrinsic or extrinsic urinary obstruction, from structural problems such as stone formation (sulfadiazine, indinavir, atazanavir, melamine) and retroperitoneal disease (methysergide, pergolide) or functional disturbances from bladder dysfunction (anticholinergics, opioids, α-1 receptor agaonists, benzodiazepines) with urinary retention (1,23,50). To illustrate the various injuries that may occur along most nephron segments and the collecting duct system and the clinical syndromes that may result from toxic substances, examples of common forms of renal injury will be briefly reviewed. They are divided into four major categories (Table 3) and some of the common offenders are reviewed below. Many forms of nephrotoxicity result in AKI. Hemodynamic kidney disease is caused by NSAIDs (including selective COX-2 inhibitors), several vasoconstrictors, and ACE inhibitors/ARBs in at-risk patients (CKD, true or effective volume depletion). The proximal tubule is commonly injured by multiple exogenous toxins, causing the syndrome of acute tubular necrosis (ATN). A classic example of ATN in the proximal tubule is aminoglycoside nephrotoxicity (7), while other nephrotoxins that affect this segment include ifosfamide, cisplatin, zolendronate, and radiocontrast (9,34–36,41–43,45). Acyclic nucleotide phosphonates promote ATN (3,5,23). Heavy metal intoxication with lead, cadmium, and mercury cause proximal tubular injury and ATN (15,16). Osmotic proximal tubular injury occurs with various sugars (sucrose, dextran, mannitol) and starches (hydroxyethyl starch) (23). Acute interstitial nephritis from prescribed and over-the-counter drugs is another relatively common cause of AKI. While B-Lactams and sulfa-based drugs are widely recognized etiologies, any drug maintains potential such as the NSAIDs, selective COX-2 inhibitors, quinolones, H2-blockers, and proton pump inhibitors, to name a few (1,5,23). Due to their widespread use, proton pump inhibitors are now the leading cause of drug-induced AIN (51). Crystal nephropathy develops following administration of indinavir, acyclovir, sulfadiazine, methotrexate, and oral sodium phosphate solution (purgative) in host with at-risk physiology (1,3,5,23,48). Obstructive nephropathy occurs with complete urinary tract obstruction from drug-related nephrolithiasis, induction of retroperitoneal fibrosis from methysergide and other drug or toxin exposures (1,5,49). Urinary retention from a host of drugs also may promote AKI from complete obstruction. Several drugs and a few exposures cause glomerular disease with associated proteinuria, which can be nephrotic range. Minimal change disease develops from NSAIDs, selective COX-2 inhibitors, and IFN-alpha, while focal segmental glomerulosclerosis (FSGS) occurs following exposure to pamidronate, contaminated heroin, and lithium (1,5,23). Sirolimus, particularly high serum levels, also is associated with FSGS in transplant recipients (52). Membranous glomerulopathy, an immune complex disease, is associated with gold, penicillamine, NSAIDs/COX-2 inhibitors, and captopril among others (1,5,23). Thrombotic microangiopathy develops with gemcitabine, mitomycin-C, cisplatin, quinine, radiation therapy, and many other agents (1,5). Anti-angiogenesis therapy with bevacizumab, sorafenib, and sunitinib have been associated with development of proteinuria and TMA (46,48). Multiple glomerular patterns of injury are described, with TMA being the most common (46,48). Briefly, a number of tubular dysfunction syndromes can occur following toxin exposure. In the proximal tubule, a proximal renal tubular acidosis or full blown Fanconi syndrome may follow therapy with acyclic nucleotide phosphonates, aminoglycosides, ifosfamide, or exposure to heavy metals and herbs such as Aristolochic acid and Akebia species (1,3,11,23). Salt wasting from loop or distal nephron tubular injury is seen with cisplatin and aminoglycosides (acquired Bartter syndrome) (1,4,31,33). Nephrogenic diabetes insipidus occurs with lithium, acyclic nucleotide phosphonates, and heavy metals such as cadmium (1,3). Most forms of parenchymal kidney injury can progress to CKD. Focusing on chronic tubulointerstitial nephritis, several agents are more commonly associated with CKD, including combination analgesics (phenacetin, NSAIDS, caffeine), 5-aminosalicylic acid (mesalamine), aristolochic acid-containing herbal remedies, and other natural/complementary product adulterants (2,11,43). Heavy metal exposure, in particular lead, can cause CTIN and CKD (14–16). Phosphate nephropathy also causes CKD in a significant number of patients (23). The kidney is vulnerable to injury from a variety of substances with nephrotoxic potential. Numerous known and potential nephrotoxins are prescribed to patients, while many are available without prescription at health food and other stores, and present in the environment. Recognizing that these substances maintain nephrotoxic potential is the first step in avoiding or reducing renal injury. Awareness of the factors that enhance nephrotoxic risk is important. These include specific patient characteristics, renal handling of the offending agents, and the nephrotoxicity of the substance itself. Importantly, all compartments of the kidney are subject to injury by these substances. Injury by these nephrotoxins results in recognizable clinical renal syndromes, including AKI, nephrotic syndrome and proteinuric renal disease, tubular dysfunction syndromes, and CKD. Putting these data together allows one to predict potential for nephrotoxicity and reduce development of kidney impairment.